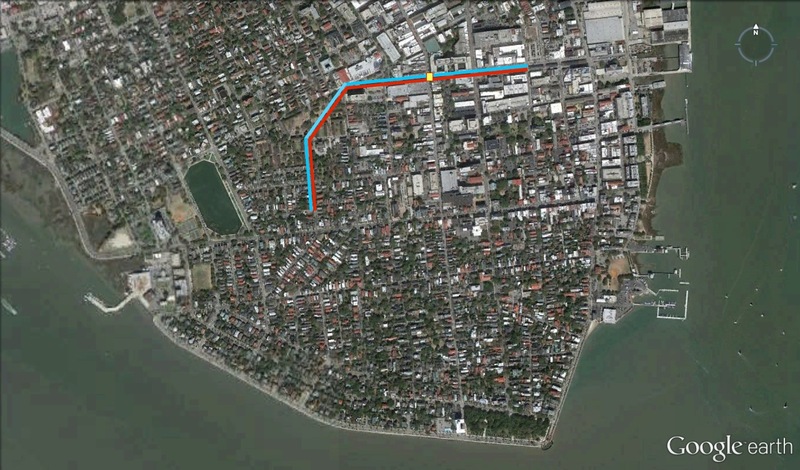 Charleston’s new northern wall of 1745 (red) and its moat (blue), and the town’s second gate (yellow) at the modern intersection of Market and King Streets. For most of our colonial era, visitors walking or riding into urban Charleston by land had but one avenue of entry: the so-called “high road” or “broad path” that we now call King Street. Between late 1703 and the early 1730s, the entrance into town was controlled by a ravelin and gate at what is now the intersection of Meeting and Broad Streets. Following the outbreak of a new war between Britain and Spain in 1739, the so-called “War of Jenkins’ Ear,” our provincial legislature commenced building new fortifications around the perimeter of Charleston. The culmination of this defensive project was the completion ca. 1745 of a new earthen wall and moat measuring approximately 3,400 linear feet along the town’s northern boundary, with a new gate in the center of the line. Beginning at its eastern flank, the wall commenced with a battery or bastion next to a marsh at the modern intersection of Market and Church Streets and ran westward approximately 2,000 feet to another bastion at the intersection of what is now Market Street and Beaufain Street (then the town’s northern boundary). From that point the wall turned southwestwardly and ran approximately 700 feet to a third bastion at the modern intersection of Magazine and Franklin Streets. There the wall turned again and headed nearly due south a further 700 feet or so, terminating in a tidal inlet extending from the Ashley River. By tracing this fortification path on a modern map, as seen in the photo above, we are reminded that the land mass of the Charleston peninsula has grown quite a bit since the 1740s thanks to various landfill projects. The eastern and southwestern ends of this wall were once connected to muddy tidal inlets that provided the town with natural barriers against any invading forces. Thus between its construction in 1745 and its demotion in 1765, this northern wall and moat funneled all traffic in and out of the town through a single portal—a ravelin with two drawbridges and a gate located at the modern intersection of Market and King Streets. This “New Gate,” as it was briefly known, was the second and shortest-lived of Charleston’s three colonial-era town gates. No visible reminders of it appear on our modern landscape, and there are no markers to commemorate its long-forgotten existence. If you have ever walked along Market Street between Church and Archdale Streets, however, you’ve actually walked along the broad moat fronting this 1740s fortification wall. Time: Wednesday, August 27th 2014 at 6:00 p.m.